Billy Lee Riley was born to a sharecropper family at the end of the great depression. His carear has spanned 5 decades and he has made his mark in each one of them. In the 50's he recorded Flying Saucer Rock and Roll which was his first hit record. Recording at Sun Studio's in Memphis, Tennessee, Riley ended up backing up many of the performers who came through the door to do session work at Sun. His guitar and harmonica work was called into play for any performer without a band. Joining him during these sessions were Roland James and J.M. Van Eaton. These three formed a group called the Little Green Men the name drawn from Riley first hit. It's 1957 and Rock and Roll is happenin'. Billy Lee receives a call from ASU to play at the old field house. Agreeing to play he shows up with his band and starts his gig. The show is cookin and the crowd's getting excited. Billy Lee climbs up on the piano and begins to dance while standing on the piano. Just a little leg jerk here and a hip shake there. Now about this time the band really starts hopping and the piano is on wheels; so as the band is dancing around on the stage the piano begins to roll. Billy Lee is doing his dance on top of the piano, the rest of the band is boogyin' away and he begins to notice that the piano seems to be moving. When he realizes that the piano is rolling off the stage he reaches up and grabs on to one of the steel girders that runs the width of the field house. He's hanging on with one hand using the microphone with the other and trying to get someone's attention to his plight. The piano is by now tipping off the stage on one side and Billy Lee is hanging suspended from the ceiling. When the song finally ends and the piano is moved back on stage Billy Lee finishes his set and figures that alls well that ends well. .... But, the dean is waiting for him as he packs up to leave and he say's "Boy, that was a vulgar show you just put on and you are banned from this school." Now the next year rolls around and the students want him back so they call and say Billy Lee come and play at the dance again this year. "I can't, he says, "I've been banned from playing at ASU. The dean says I can't play there again." They say, "The dean doesn't know your name. Change your band name to something else and come back and play." So Billy Lee changes the band's name and goes to ASU to do the gig. Once again the show is hot and everyone is having a great time. Once again the dean meets him at the end of the performance and say's "Boy, you are banned from ASU"
My name is Billy Lee Riley, I was born October 5, 1933 in Pocohantas, Arkansas. A small rural town in northeast Arkansas in the foothills of the Ozarks. At the age of three my family moved from Pocahontas to Osceola, another small rural Arkansas town founded on the banks of the Mississippi River. Osceola was a cotton farming town and we moved onto what was once a large plantation owned by Mr. Hal Jackson. Therefore it's name was "Jacksonville." The houses on the farm was used as rental property. If a tenant wanted to live there and work on the farm his rent was free. But if a tenant preferred working jobs other than farm work the rent was one dollar per week. My father was a house painter by trade so he chose to pay the dollar a week rent. But in the fall and winter months when painting work was scarce, my dad and my older sister worked in the fields picking cotton. 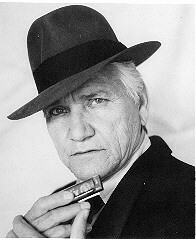 I learned to play the harmonica at the age of six and my love for blues music started at that age. Some of my black friends, playmates and I would go over to the black section of town and listen to the black blues singers playing on the streets or sit by the doors of the honky tonks and listen to music from the juke boxes. Saturday afternoons for most other kids my age was a Saturday matinee western movie. I did that, too, but most of the time a Saturday matinee for me was the sound of the blues coming from the juke boxes at the beer joints. My family moved from Osceola in 1942 after our house burned to the ground with all of our belongings, what little they were. This would be our first year as share-croppers. For the next four years we lived on this farm at Poplar Ridge, Arkansas. We farmed twenty-five acres of cotton expecting to receive half of the earnings, but we always wound up owing the land owner, so each year we would have to stay and try to get even. We never did. I first worked in the fields in Osceola at the age of seven picking cotton but working for me the next four years became serious business. I did the work of an adult. Each morning at the crack of dawn I was in that barn yard harnessing up my team of mules for a long hard day's work of plowing. My dad, brother, and I did all the field work and mom took care of the house and the younger kids. I had to quit school in the third grade to help on the farm to support the family. In 1943 my dad had bought me my first guitar from a friend on the farm. It was a Silvertone from Sears. He gave five dollars for it, but I had never learned to play it until moving to this plantation. There were forty families and thirty six were black families. Almost every family had someone that played some sort of musical instrument. For the most part all of the families living on this plantation were good decent folks. You would run into a bad apple every once in a while but in general, everyone got along very well with his neighbor. Everyone was treated the same by the land owner regardless of his color. We were all there for one purpose and that was to make money for the MAN. I had special friends living here, both black and white. These are the ones that taught me how to play the guitar and helped me to understand, love and appreciate the blues. Special names like, Willie "Snooks" Bradshaw. Willie was a great blues guitar player and he worked a lot teaching me to play. Another special friend was a white boy my age. His family was a musical family and I spent lots of time at his house he taught me a lot. His name was Tommy Hamblin. Two other good friends of mine, even though they were a lot older than me were the Williams brothers, Ray and Abraham. Ray was a whiz on the harmonica. He taught me what I know on the harmonica. Ray was a great influence and a great guy. His brother, Abrham played bottle neck style guitar and was one of the beat. But, the one man that I considered the best of the lot was an old man by the name of Jericho Leon Carter. Jericho was an excellent guitar player as well as a master on the harmonica. He had built this aparatus on his guitar that held his harmonica so he could play both at the same time. I had never seen anything like this before or since. We all loved to play music with Jericho but most of the time when old Jericho played we all just sat there and listened. He was so good and made it look so simple. He used to tell me, "You keep on son, you keep playing the Blues and some day you gonna be somebody." I never forgot those words and maybe someday I'll find out that old Jericho was right. Everybody called Jericho, "Lightnin". The reason was, as it was told, Jericho was riding his mule in from the field one day during a thunderstorm. Just before he got ot the safety of the barn the mule he was riding was struck by lightening. Well, it killed the mule but Jericho survived with severe burns all over his body. They said he almost died before they could find a way to get him to the doctor twnety miles away in Forrest City. But he did live, and when I met him he was fifty-eight and the best blues singer and picker in the world. After our crops were gathered that winter we moved to Tupelo, Mississippi. 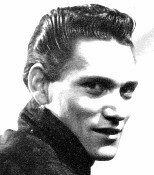 I learned later that my friend, Jericho "lightnin' Leon" Carter died of pneumonia in February 1948. They buried his guitar and harmonica with him. His folks said they felt like he would be needing them later. We only lived in Tupelo from January 1948 until September. My parents and the smaller children moved back to Pocahontas and I moved back to Osceola to live with my sister and brother-in-law. My older brother had recently enlisted in the Army so I thought I would try also. In November some friends and I hitch-hiked to Blytheville to join the Army. I got as far as the physical examination and failed. In March of the next year, 1949, I tried again. I had no birth certificate so the enlisting officer told me that if I could get my parents to sign a statement that I was seventeen he could get me in. I conned my sister into signing the papers and I was off again. This time I passed and was shipped to Camp Chaffee, Arkansas in Fort Smith for my basic training. After basic training I was shipped to Fort Bening, Georgia for paratroop training. I found out very quickly that jumping out of air planes was not for me so I quit and was then shipped to Fort Lawton, Washington. I was given a hardship discharge because of my father's sickness. I was hoping that I would be more able to help the family at home. I was sending fifty dollars of my seventy-five dollars a month home on a special family allotment plan but I thought I would be able to do more if I could find a job. Work for a fifteen year old was hard to find in the early fifties so I did whatever job I could find to help out. Dad's illness improved and he was back at work painting houses and we had just gone to war with Korea. Being in the reserves, I was one of the first to re-called to active duty. Three months after I was discharged, I was back on active duty in Fort Sill, Oklahoma. I never saw Korea. I spent the next three years at Fort Sill. In April, 1953 I was honorably discharged and came home to where my parents were living, Jonesboro, Arkansas. The first thing I did upon returning home was form a hillbilly band. The band played at high schools and clubs. We had three radio shows. Two of them were live broadcast and one was taped on Sundays for the following week. I was working at a local shoe manufacturing plant at the time and in order to do the live broadcasts we had to get up to be at the station to go on the air at 5:30 am, do thirty minutes, go home have breakfast and be at work at 7:00 am. Needless to say, this didn't last long. I married my first wife in 1954 and in 1955 we moved to Memphis and opened a bar and grill restaurant with my brother-in-law. Not knowing much about Memphis, nor the restaurant business, we picked a bad section of town and were closed by the city three months later resulting from a gunfight between two of our customers. After that I worked at various jobs one being a meat cutter at a supermarket. On Christmas morning 1955 I met the one man that would play a major roll in my life, Jack Clement. My wife and I were visiting our families for the holiday. I was leaving Jonesboro to visit my parents in Nettleton, a suburb of Jonesboro when I saw these two fellows hitch-hiking. Although I was only going the three miles to Nettleton, I decided to stop and give them a ride that far. The fellows I had picked up were Jack Clement, a well known name in Nashville for the past thirty-five years, and his friend, Slim Wallace. Our conversation was getting so interesting by the time we got to Nettleton that I decided to drive them all the way to Memphis. We talked a lot about music and when they found out that I was a singer, they invited me to sing in their band and play the club in Paragould, which belonged to Slim. I agreed and for the next few weeks I worked every Friday and Saturday night. When we got to Memphis, Jack and Slim showed me the studio that they were building in Slim's garage on Fernwood Street. It was to be called "Fernwood Studios." A studio that later included Scotty Moore, of Elvis fame. When the studio was finally finished it was equipped with a home Magnachord recorder and a patch for three mikes. But to me it was "downtown". Jack asked me if I wanted to be their first artist, of course I was flattered and jumped at the chance. the session was set up for a Sunday afternoon in March of 1956. It was supposed to have been a country session but one of the songs turned out a little more bluesy and a little like Elvis' Heartbreak Hotel. This song was called "Trouble Bound" The other song, more of a country song, was called "Think Before You Go"
After we recorded them, Jack took the tape to Sam Phillip's Sun Studio to have an acetate master made. Sam was the only one in Memphis with a lathe for mastering a record. Sam cut "Think Before You go" first and then started on the other side, "Trouble Bound." He told Jack, "Now here's a record. This is what the kids want, Rock-A-Billy. They're looking for that Elvis thing and this record has it." Before Jack left the studio he had made a deal with Sam to release my record on Sun with the understanding that we cut another Rock-A-Billy song for the other side. Jack told me about it and asked me if I had another song that was more Rock-A-Billy. I told him no but I could write one. So, I wrote "Rock With Me Baby" and we went to a radio station and recorded it. Jack took them back over to Sam. He gave me a recording contract and Jack a production deal. I recorded for the Sun label from 1956 until 1960. I recorded several sides during that period but only had six releases, "Trouble Bound" / "Rock With me Baby" being my first release. My second release was "Flyin' Saucers Rock and roll" / "I Want You Baby." Before I recorded "Flyin Saucers," I walked in the studio at Sun one morning and saw this fellow sitting at the piano and playing like I had never heard a piano played before. I spoke to him and he introduced himself to me. "I'm Jerry Lee Lewis," he said. "Hi, I said, "My name is Bill Riley. Man you play the piano great. You from around here?" "Naw, I'm from Louisiana, Farriday Louisiana. I come up here to see what's goin' on," he told me. I asked him if he was working with anyone and when he told me he wasn't I asked him if he was looking for work because I had a band and we did a few shows but mostly clubs. He said he would like to work with us so I hired him. Later I told Sam about him, about how good he played and that I had hired him to work with my band. Sam said "Man, you don't want no piano player in a Rock-A-Billy band. It don't work in a Rock-A-Billy band. Man you need guitars, drums, and a bass, but not a piano." Well, I knew my session was coming up soon so I told him that I intended to use Jerry on my session. Sam grumbled and disagreed with me but come session time, Jerry was on board. Sam wouldn't let him take any solo's. He just wanted him to play what he termed, "pumping rhythm." That's where his PUMPING PIANO style got its name. After the session was over Sam was pleased but never had any praise for Jerry. Jerry continued working in the band until "Crazy Arms" was recorded. During my stay at Sun I was part of the Sun package. This package included, Johnny Cash, Roy Orbison, Carl Perkins, Warren Smith and later on Jerry Lee Lewis. Shows were booked by Bob Neal and getting your money was sometimes a hassle. I've had to go to Bob's house at three and four in the morning after a show to get my money. We all were supposed to get paid after the show but this seldom happened with Bob. My band and I played lots of colleges dates back then also, lots of high school proms and dances, a lot of outside shows at openings for automobile companies, mobile home shows and drive in theaters as well as regular theaters. It was hectic, a lot of fun and we paid a lot of dues. We traveled in my 1957 four door Chevrolet. Five musicians plus all of our clothes and instruments including sometimes, an upright bass, inside if it happened to be raining. 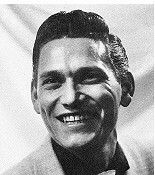 I left Sun Records in 1958 for a one record deal on Brunswick produced by Owen Bradley at Bradley's barn because Sam had deliberately sabotaged a record of mine, that was on it's way to the national charts in favor of a Jerry Lee Lewis record that he was trying to build Jerry on, "Great Balls of Fire". My band and I were working in Canada at the time and out of a bet with my drummer I called Allen Freed about booking us on a tour that I had read about in the trades a few days before. I called WINS radio and got through to Allen. It was then that I found out that my record, "Red Hot," was happening. I knew that it was doing pretty good in the south but no one had told me that it was looking good nationally. Allen Freed told me that I had a hit record and back then if Allen Freed said you had a hit you could take that to the bank. He also said he wanted me on the tour for later that year. After talking with Allen, I called Sam Phillips and told him the good news. He seemed, I thought happy about the whole thing but I was wrong. He told me that I should close out in Canada and come home and start an album and cut another single before the tour. But by the time I closed out and got back home, Sam had contacted Allen Freed's manager and cut a deal with him that got me off the tour and Jerry Lee Lewis put in my place. To rub salt in the wound, a couple of days after I returned to Memphis, and before I found about the switch, (I didn't find this out for over a month. I thought Sam and Judd Philips were handling everything with Allen Freed and I was on the tour.) I was in the front office at Sun when the mail came and Sam's secretary opened it and laid it on Sam's desk. I noticed that there were three pieces of mail that looked like Western Union Telegrams. These were night letters sent through the Western Union. Each letter was an order for ten thousand copies of my record "Red Hot". One was from a distributor in Ohio, one was from New York and the other one was from Detroit. They were asking for ten thousand on a deal. I assumed that meant Sam had some sort of deal where if you buy a certain amount you got some free copies. I asked Sally when Sam would be in and she told me she didn't know so I went next door for coffee. I saw when Sam's car pulled up in front of the studio so I went back over to catch the reaction on Sam's face at the amount of the orders for my record. What I saw and heard wasn't what I wanted to see or hear. As soon as Sam saw the orders he got on the phone and called each of the distributors and told them that he was not shipping number 277, the number of my record, he was pushing number 281, Jerry Lee Lewis' "Great Balls of Fire." This is the time that I left Sun and went to Nashville to record with Brunswick. I returned to Sun after the Brunswick record and recorded three more releases before leaving in 1960. They were "Baby Please Don't Go" / "Wouldn't You Know", "No Name Girl" / "Down By The Riverside", and "One More Time"/"Got The Water Boilin' Baby." Most of the records recorded on Sun from 1956 until 1960 were backed up by my band "The Little Green Men" All or part of the band was on recordings with Johnny Cash, Roy Orbison, Charlie Rich, Bill Justis and all of the lesser knowns. After leaving Sun for the last time in 1960 my ex-guitar player and I formed the RITA record label. We had several releases but the one that the label is known for was the Harold Dorman recording of "Mountain of Love." This record sold a million and I made a thousand dollars. When the record started to show up in the charts, several record labels wanted it. We were offered some really good deals. But to humor Judd Philipps and Bill Justis, who were already doing business with Bill Lowery in Atlanta, we went with NRC Records. The company went broke before we could get any money so I sold my interest for one thousand dollars and came out ahead of my partner. After RITA, I formed another label, MOJO Records, and produced the original Willie Cobb hit, "You Don't Love Me." This record was leased to Home of the Blues Records. After the Willie Cobb record I did a few more things on MOJO but just never got anything happening so I moved on. I went to work for the Pepper Sound Studios writing, singing and producing radio spots and jingles. I moved to Las Angeles in 1962 and worked as a studio musician playing the harmonica along side James Burton, Glen Campbell, Leon Russell, Hal Blaine and Barney Kessel. My first session was with Herb Alpert. I played lead guitar on "Lonely Bull." I was later featured on records with Dean Martin, Sammy Davis, Jr. Rick Nelson, Johnny Rivers, The Beach Boys and hundred of others. I worked on several records with Billy Strange and Lee Hazlewood. I worked on stage with Eddie Fisher, Pearl Bailey, Dean Martin, Janet Leigh, and Natalie Wood. I appeared on the final Steve Allen show, was featured on an ABC Scope, and I did the Ozzie and Harriet Show. I worked the Whiskey A-Go-Go in Las Angeles and alternated with Johnny Rivers opening other Whisky's across the United States. While living in Las Angeles I recorded six albums. Three for Mercury, two for GNP, and one for The Crown Label. I left Las Angeles in 1966. I left Los Angeles in 1966 settling in Atlanta and reviving my MOJO label. I released one album and one single. The single was picked up by STAX in Memphis causing me to move again to Memphis where I was producer and artist on the HIP label, a subsidiary of STAX. In 1968 I recorded a song called "Kay". It was an R&B version of the John Wesley Ryles country record. When I finished it I played it for Sam Phillips and he suggested I play it for Shelby Singleton who had just bought all of the old Sun masters and had formed the Sun International label. Shelby bought the record and gave me a job as producer and moved me to Fort Walton Beach, Florida to produce for his studio there. After a year in Florida, I found my self again in Atlanta. In 1971 I recorded a session for Chips Moman in Memphis for his Entrance label distributed by Columbia Records. My record, "I Got A Thing For You Baby" was ready to break nationally when Columbia and Chips had a misunderstanding and my record was pulled from the their distributors so I lost another hit. I followed Chips to Nashville hoping to record again but his record deal fell apart. I left and came back home again after my divorce from my second wife. I remarried in 1975 and sort of retired from music for a while. then in 1979, I did the Memphis in May thing, got the bug and started touring Europe and have been doing so ever since. My shows in Europe are mostly my fifties act. I enjoy doing them and the fans are great, but I am ready to get back to my roots, The Blues. 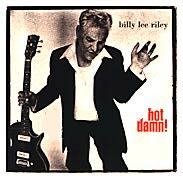 Buy Billy Lee Riley CDs at Amazon or anywhere.